Pos./Neg. flip-flop door lock outputs. Shock Sensor Bypass from remote. Selectable door-lock timing (0.5 or 3.5 second). Patented Q.Q.T. for quick and quiet test of alarm. Patented Fail-Safe Arming verifies the alarm will arm. Patented Phase-5 Protection assures continual protection. Dual Power Protection (D.P.P.) against cutting of alarm's power. Easy code-learning of transmitter, with Code Wash to delete lost or stolen codes. Arm/disarm from up to 200 feet. Use for 2nd channel (trunk release) and panic. Quiet Mode overrides chirp through remote. Shock sensor bypass through remote. Super-small, 3-tone, 128dB. No "toy" sounds. Chirps for armed, disarmed, pre-intrusion alert, and zone bypass. Patented Stay-Safe Disarm shuts off sounding siren without disarming the alarm. Separate pre-intrusion & trigger adjustments. Indicates alarm arming (in passive mode), armed, disarmed, valet mode, RF transmitter reception, and trigger memory. Controls valet (panic can still be activated), emergency disarm, and onetime override of passive arming. Multiple inputs trigger alarm when trouble occurs. Flash for armed, disarmed (special car locator function), pre-intrusion alert, zone bypass, and tamper. Flash continuously if alarm triggered. Flash when transmitter is used and alarm is in valet. Pos./neg. output, single or dual (European) circuit. Handles most vehicles without need for relays. Lock/unlock doors via remote, even while driving or in valet. Disables starter once alarm is armed. Starter sensing triggers alarm if thieves attempt to start car. 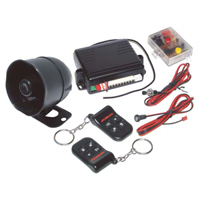 Active/passive arming, current/switch sensing, ignition locking/unlocking, doorlock timing, double pulse unlock.